Doggedly obvious melodrama...But what makes the clichés palatable is a communal commitment to getting the story right. 114 min. Paramount Pictures. Director: David O. Russell. Cast: Mark Wahlberg, Christian Bale, Melissa Leo, Amy Adams, Jack McGee. Hollywood’s school Christmas pageant has arrived, and it’s called The Fighter. Everyone knows that show you attend a little out of obligation and a little out of a genuine desire to support the performers. It’s not so much about art as about showing off, and you might as well roll with it, or it’s going to be a long night. Though no one plays a Christmas tree in David O. Russell’s fact-based Oscar contender, Christian Bale would no doubt welcome the Method-acting challenge. Rather, Bale plays a crackhead (merry Christmas!) in mid-’90s Lowell, Massachusetts. Ex-boxer Dicky Eklund milks his status as “The Pride of Lowell” as he struts the streets, crowing, “Making my comeback!” Walking a half-step behind Dicky, younger half-brother Micky Ward (Mark Wahlberg) wears a weary smile. There’s love in it, but also hard-earned resignation. Micky trusts Dicky’s boxing instincts—which The Fighter boils down to the sweet but not-so-rocket science of “Head, body, head, body”—but Micky’s no fool. When a promoter dangles a deal with the condition of “no crazy-time nonsense” (meaning no Dicky and no Alice), Micky recognizes the opportunity, though it takes the moral support of new girlfriend Charlene (Amy Adams) to take a leap. The Fighter prizes these chewy family dynamics: the sibling rivalry, the tested loyalties, and the steady corrosiveness of a family that’s just a little too scrappy for its own good (director David O. Russell indulges comic caricature by glibly treating the seven Eklund sisters as one foul-mouthed mass of big hair). And certainly The Fighter is nothing if not a traditionally crowd-pleasing boxing movie, with its sights set on come-from-behind victory and fight sequences that eschew visual flash in favor of impressive realism. No notions challenged here: just doggedly obvious melodrama. But what makes the clichés palatable is a communal commitment to getting the story right: Bale thinned his hair and body and studied recordings of the real Eklund, Wahlberg trained heavily and kept Ward by his side every day, and Russell shot on location in Lowell. Screenwriters Scott Silver, Paul Tamasy and Eric Johnson thread in a documentary crew shadowing Dicky (as one did in real life), an effective device that also serves as prelude to the de rigueur tactic of placing footage of the real-life characters in the credits. Bale swings for the rafters with his bundle-of-nerves extremity, and it’s certainly impressive work, but pity Wahlberg who risks disappearing next to Bale by so quietly giving the picture everything he’s got: his technical skill goes into the ring, while his emotional subtlety rings true. 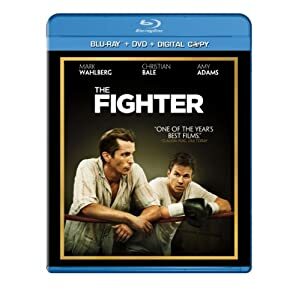 In a Blu-ray/DVD/Digital Copy combo pack, The Fighter comes out swinging with a one-two punch: a brilliant hi-def transfer and a strong selection of bonus features. The image quality is outstanding: primarily, the picture retains its filmic quality with light, unbothered grain and accurate representation of color and contrast. Detail and texture are tack-sharp, contributing to an overal dimensionality that's quite impressive (the only quibble is occasionally evident banding). As for audio, there's no beating the DTS-HD MA 5.1 lossless mix, which gets high marks for clarity of dialogue and potency of music, as well as discrete separation of elements for a convincing immersion. The disc comes with audio commentary with director David O. Russell, recently nominated for a Best Director Oscar. Russell goes through the details of pre-production, production and post-production, as well as the true story the film captures. "The Warrior's Code: Filming The Fighter" (29:57, HD) features behind-the-scenes footage and cast and crew interviews, with particular attention to the work of the actors and the thoughts of the real-life players, like Micky and Dicky. "Keeping the Faith" (8:33, HD) puts the focus squarely on Ward and Eklund family members. Sixteen "Deleted Scenes" (16:53, HD) come with optional director commentary: "Meet the Sisters," "Legend of Dicky Interviews," "Dicky Runs," "Dicky's Got 'Yolks,'" "Tease Alice," "Boo Boo in the Limo," "Post Mungin Sisters Interview," "Dicky Dancing," "Dicky Interview Behind Bars," "Crack St. Promo," "Alice Visits Dicky in Jail," "Cavity Check," "Dicky Tries to Leave Prison," "Post Sanchez Interviews," "Dicky Makes Amends," and "Dicky Mini-Doc." Lastly, the disc includes the "Theatrical Trailer" (2:32, HD). Enthusiasts of the film (and of Oscar winners Christian Bale and Melissa Leo) will definitely want to turn their home theaters into permanent ringside seats. All site content © 2000-2019 Peter Canavese. Page generated at 04/17/2019 06:54:15PM.